Hooray! The day has finally arrived for the annual Cat Lovers Hop! I’ve been excitedly bouncing around like Tigger the past couple of days! I know we all look forward to this annual hop and I think it’s appropriate to start off with a special thanks to Janis over at HerPeacefulGarden for all the hard work she puts into this special event! Let’s give her a big round of aPAWs!! 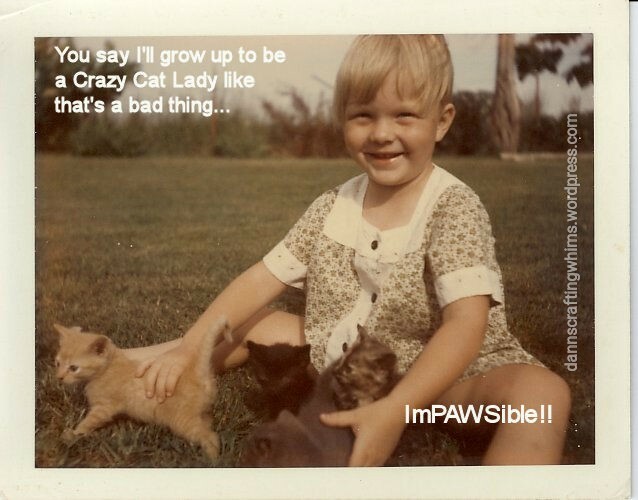 Be sure to check out her link up page (HERE) for all the details and for the aMEOWzing list of sponsors she lined up! If you’ve been watching on Instagram you know I have a lot of fun stuff in store for you… Thankfully, I’ve had a year to prepare! On my blog, there will be cards, calendars, home decor, jewelry, a guest designer, sci-fi cats, games, giggles and more – all featuring those dear, precious critters we all love… cats! I’m working on a giveaway, too, so you’ll want to stay tuned for that. When you pull on the heart tab, the romantic kitty slides over to plant a smooch on his sweetie – at which point the heart lights up and the words oh-la-la! are revealed! Confession: I cannot believe that I engineered the placement of wiring for the light and the slider on the inside just so, but I was so excited to try it, I turned it over and sealed it up, found out it worked and THEN reached for my camera. DUM-DUM want GUM-GUM?! lol! Guess you’ll have to wait a while until I do another one to see the inner workings. Sorry! Wondering where I got that aMEWsing beret? It came from the Newton Dreams of Paris set… I just fussy cut it off that kitty (who’s not looking in the right direction for this kiss), snipped the lines on both sides of his ear and it tucked perfectly around. It just makes MY heart go pitter-patter! … I’ve done it so many times, I hope I haven’t used up the battery before my recipients get to play with it! I will be back later on today with more feline fun. 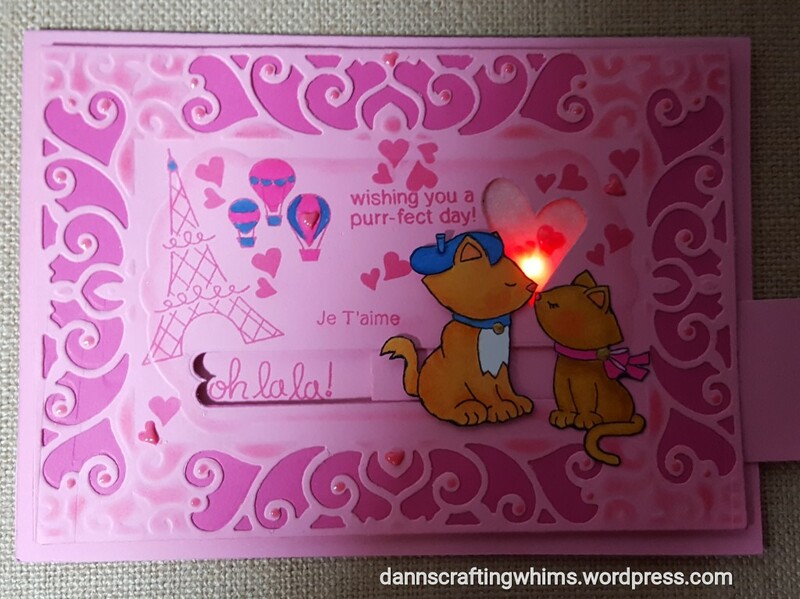 This entry was posted in Anniversary cards, Cards, Friendship Cards, Light-up cards, Papercraft, Slider Cards and tagged anniversary card, cardmaking, CatLoversHop2017, chibilights, chibitronics, handmade cards, Interactive cards, kissing cats card, Lawn Fawn Slide On Over, light-up card, Newton Dreams of Paris, Newton's Antics, Newton's Nook, Newton's Nook C Cuddles, newtonsnook, papercrafting, Papercrafts, Slider, slider card, Spellbinders, Spellbinders Exquisite Labels 11, The Cat's Pajamas Heart Trio, thecatspajamasrs by dannscraftingwhims. Bookmark the permalink. D,Ann….this card is pure genius!! I love the colors and the interactive sweet smooching couple from the Newton’s Nook set! How clever of you to add the Chibitronics light up feature with the heart and the Oh La La that gets revealed. That part gave me the giggles! What a fabulous kick-off for our 2017 Cat Lovers Hop. Thank you so much for all your support and encouragement!! What a creative piece of art, D. Ann. And so very cute and LOVE the interaction. D.Ann, this is adorable! What an absolutely brilliant idea! You are so super creative! Love this! So adorable and so cool! Awesome card! Great job on your light up card! It’s adorable! Love those kissin’ kitties! Oh, D.Ann, what a fun and fabulous slider card! Love the kitties kissing and the light up is wonderful. 😀 Loving the glass kitty you used for holding the card. So cool that it moves and lights up! Wow! I love your “lighted” card! I have been seeing these and want to try one too in the future. Thanks for the inspiration!!!! Cute design and colors….plus sweet kitty images. OH my gosh D.Ann! This is adorable and intimidating at the same time..haha! I am not very adept when it comes to extra additions to my paper crafts, or paper engineering so I am in complete awe over this interactive card. The lights in the heart and the slider element are just genius. Your light up card is gorgeous! I love Chibi lights and whoever you give it to is always impressed. Wonderful card for the Cat Lover’s Blog hop. Oh my goodness! I adore this card! I have been checking out those lights and I am thinking I’ll finally take the plunge and get myself some! Charming kissing kitties ❤ Hugs!! Oh my goodness!!!!! This is the cutest card and then it’s even interactive with lights! Fabulous job! Eeee!! How PAW-some 🙂 This card is such a brilliant design… loving the kissing kitties and the light is genius. What an adorable little kitty card! Extra fun that you added a light up feature! So happy you linked this up to Cropstop — do join us again and help us reach our goal of 100 links this month! What a fabulous card! Never seen a card tat lights up before. Super cool! Hello, D.Ann! Yay for the Cat Lovers Hop! Your card is not only adorable, but it is so cool! You made a slider and a light-up all in one – now that’s an interactive card! Lucky person who receives this one! Oh my heck-a-daisy. This card is so stinkin’ adorable! I love that it slides and it lights up and features such romance (oh la la indeed)!!! oh my gosh!! Just look at that! What an awesome slider card! Sweet how they come together to kiss… just so creative!! This is just amazing and would so fun to play with. I don’t blame you for almost wearing it out because I would be doing the same. 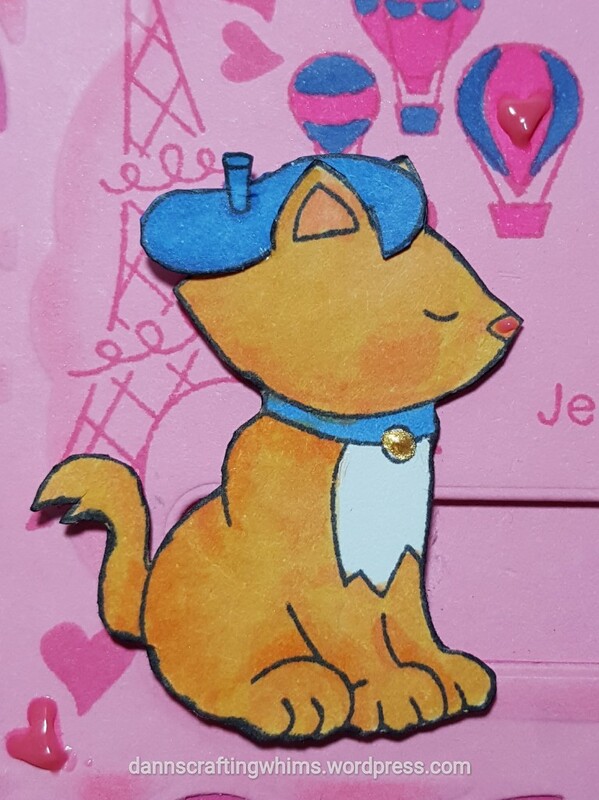 You are so clever to use the beret from another set to make this kitty even cuter. Absolutely PURRfectly adorable! I’ve been meaning to get my hands on the light kit! Brilliant startup! Purrfectly adorable, love the impact of light! Such a fabulous kinetic kitty card – love the movement, but the lights really make it very special. Clever idea and one that I need to try! It’s soo cute and pinkish!! 💓 I really love the way you made it as a slider card and it’s so adorable the way it lights up..!! WOW!!!! This card is AMAZING! I can’t believe all the awesome interaction it has with the slider AND the lights! Whoever you send it to is going to LOVE it! Plus, those kissing kitties are adorable! 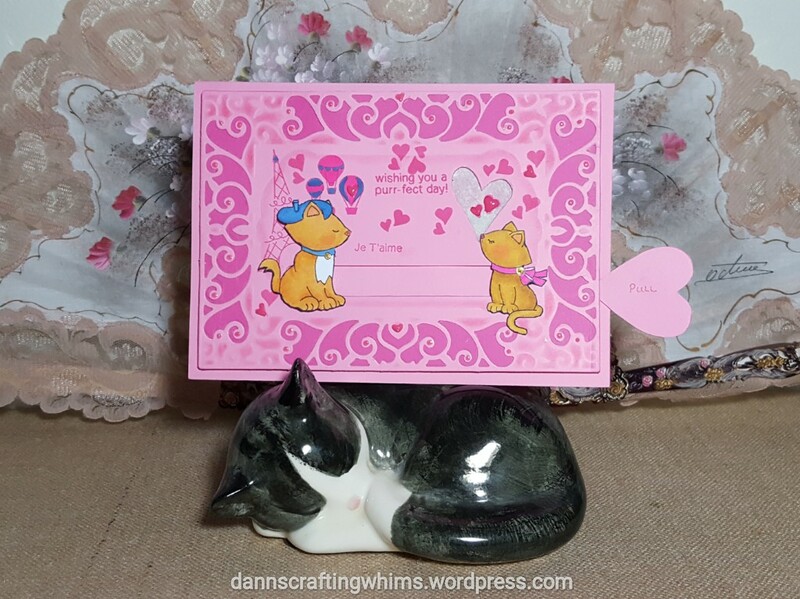 Thank you for featuring our stamps on the Cat Lovers Blog Hop!